The Winter Spira l is a festival that is unique in our calendar of the year. There are no presentations by the grades, no speeches by the administration. Instead, we sit in silence in a darkened room, listening for a song sung by a single voice as a candle is lit in the center of a spiral of evergreen boughs, a symbol of life amidst the dead of winter. Then, as quiet music plays, each child in turn takes a candle into the center of that spiral and lights it, then places the candle in an apple along the path. The lights brighten the path for those who come after. Each child walks alone, at his or her own pace, in his or her own way. This is a celebration of quiet confidence, of carrying light in darkness, of sharing that light with others. You are invited to attend this festival, not only to watch your own children, but to watch how they are in the community of their peers. How does each child approach the candle at the center of the spiral? Are his footsteps halting or rapid? Does she stop along the way to consider each crystal and shining stone in the path before placing her candle near the way out of the spiral, or does she set it down right away and hurry on without looking back? Being a witness to this journey can be a moving experience, and adults and children alike carry away from the festival the feelings and meaning they found within it. Here in the Northern Hemisphere, we are entering the darkest days of the year. The sun is down by dinner time, and even at noon the shadows are long and slanting. Holiday preparations are in full swing, and our minds swirl with plans for gifts, meals, treats, crafts, decorations, travel, cleaning. When we look out into the natural world, we see the opposite of this constant, harried motion. The earth is growing quiet. The plants and animals are storing away food for the cold months or preparing to sink into dormancy. When the snow comes, the quiet will be even deeper. It is no accident that so many festivals are planned for these dark days. Celebrations of light, community, sharing — these remind us to carry the gifts of summer with us into the quiet of winter. At the time of the longest night, we find joyful celebrations of returning light. The Jewish celebration of Hannukah, the remembrance of the rededication of the Temple and of the miracle of lamps whose oil should have lasted one day and lasted for eight, falls at this time of year. The Hindu festival of lights, Divali, has just passed. 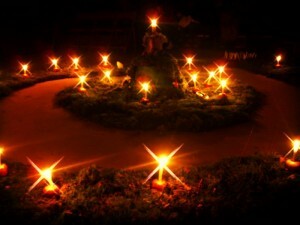 Many earth-based traditions honor the winter Solstice with special joy, lighting fires and candles and exchanging gifts. The word “Advent” means “coming” or “arrival.” It is used in the Christian tradition to refer to the four Sundays before Christmas, when people prepare for the birth of the Christ child. However, this seasonal observance has been kept by people around the world from all paths and beliefs; as autumn gives way to winter, we prepare for the return of the sun, the lengthening of days, and for the insights that we can gain from reflection on the year that has been and on what may be to come. In Waldorf schools, for many years, children of all backgrounds have participated in the month-long observance of the rebirth of the light through songs, stories, craft activities, and the Winter Spiral festival. It is a way to give them an experience of quiet beauty in a season of busyness. In our school, the grades students gather each Monday morning for a special story to set the mood for the week. Each week honors one of the kingdoms of nature – the minerals, the plants, the animals, and humankind – and this is brought into classroom activities and decoration as well.